We are committed to keeping your information private. When you provide us with information, we only use it to fulfil your orders and provide you with our newsletters if you have subscribed to receive them. We will never share your information with another party. Our website may collect information about the IP address, browser and operating system you’re using, to help us evaluate shopping trends, but this is never linked to your personal information. You can access or withdraw the information we hold about you at any time. Please Contact Us if you have questions about privacy. All personalised and premium designs on this website have been created by Babies 2 Infinity and are Copyright protected. All Rights Reserved. 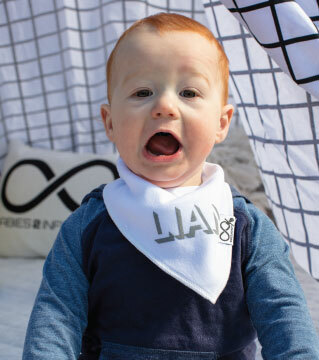 The text, images and products displayed are copyright to Babies 2 Infinity and may not be copied, reproduced or modified in any way without their express permission. All products listed are described to the best of our abilities. All care is taken to ensure this information is correct, but we cannot eliminate the possibility of error. It is the purchaser’s responsibility to ensure the accuracy of the chosen colours and information provided for custom and personalised orders. We recommend you double-check the spelling of the child’s name and other details (such as date and time of birth) before submitting your order. Once the order is processed, there are no refunds for products created with inaccurate details supplied by the purchaser. Once your order is placed, we will accept that order as final, and changes or cancellations cannot be made to the order unless you contact us directly. By placing an order, you agree to all the terms and conditions stated on this page.